Those who dance "swing" often refer to dancing as a conversation. It's a strange metaphor at first, but it starts to make sense. Think of a time when you and two of your best friends sat around, maybe over a coffee or a beer, in a cosy cafe or at a bar, and had a really good laugh about something. This is what swing dancing feels like - for around 3 minutes at a time, you, your partner and the music interact with each other and feel a close connection. You make jokes, riff off each other, talk about common interests, and at the end of it, you know that you've had a moment that will never be exactly repeated. On the dance floor, we speak to each other in the language of rhythm, connection, leading and following, and every conversation is different. In class, we help you find ways to communicate with each other clearly, so you can have the best time possible, but we don't tell you exactly what to say. Everyone is different, moves differently, speaks differently. This is what makes swing dancing so social, and endlessly fun. Our goal is that when you get out on that dance floor, with the music pumping and your partner eager to move with you, you feel confident and ready to experience all the joy of this exact moment. Swing Dancing is dancing done to swing music. Pretty simple! To be a bit more helpful, "Swing dancing" is a term for a family that incorporates a number of different dances - the most well known of which is called "Lindy Hop", but also includes Balboa, Solo Jazz, Charleston, Shag, etc. 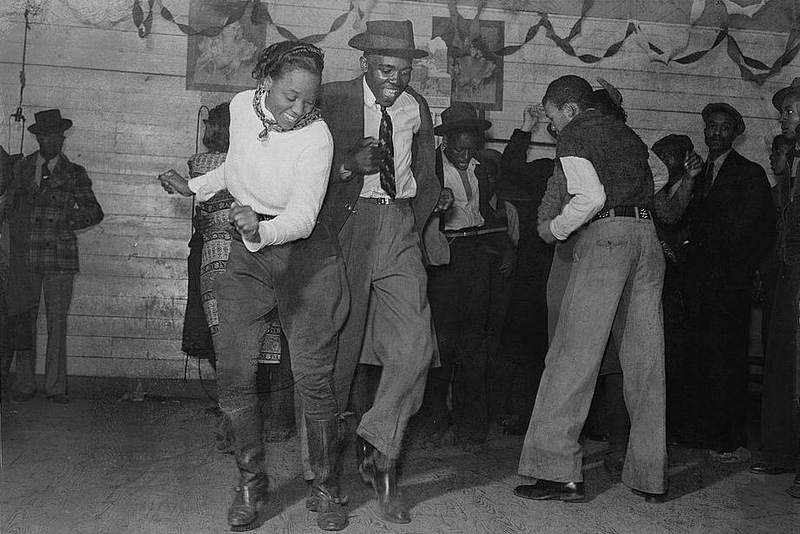 The dances and the music evolved in step with each other during the 1920s, 30s and 40s. In Harlem in particular, but all throughout the USA, there were significant social shifts underway, and the melting-pot brought together African rhythms and movement, European ballroom dances, and even the occasional South American / Latin flavour thrown in. The music became more improvisational, and so did the dancing. The music grew more upbeat and "raucous", and so did the dancers. The eventual outcome was a variety of dances with common elements that let the dancers both show off to their friends (and there were plenty of opportunities for competition/performance) but also to dance with strangers. The most popular dances were called names like "Lindy Hop", "Shag", "Balboa" and "Charleston", amongst many others. Bands and bandleaders like Count Basie, Glen Miller, Artie Shaw, Lionel Hampton ruled the airwaves, and singers including Ella Fitzgerald, Mary Lou Williams, Billie Holliday, Louis Armstrong, Etta James, Ethel Waters and many others were the celebrity superstars of the day. Dance halls with live music were common. The Second World War came along, and things changed. The demand for "sweeter" music climbed, as did the preference for records which could be packaged up neatly and sold or sent overseas. The golden age of swing began to decline. By the 60s, most of the bands had split up, the famous dancers retired or doing much smaller productions. This carried on, well into the 90s, until several groups of people (at almost the same time) began to seek out some of the original super-star dancers to teach them how to move. The revival itself is a massive story, but the important thing to know is that you can now dance swing in almost any major city in the world. There's a lot more to this story, and we recommend that you check out the incredible resources at Swungover to learn more.